The M6.6 mainshock of the Niigata Chuetsu Oki (offshore) earthquake occurred at 10:13 a.m. local time on July 16, 2007, and was followed by a sequence of aftershocks that were felt during the entire time of the reconnaissance effort. The mainshock had an estimated focal depth of 10 km and struck in the Japan Sea offshore Kariwa. Analysis of waveforms from source inversion studies indicates that the event occurred along a thrust fault with a NE trend. The fault plane is either a strike of 34 degrees with a dip of 51 degrees or a strike of 238 degrees with a dip of 41 degrees. Which of these two planes is associated with the mainshock rupture is unresolved, although attenuation relationship analysis indicates that the northwest-dipping fault is favored. The quake affected an approximately 100-km-wide area along the coastal areas of southwestern Niigata prefecture. 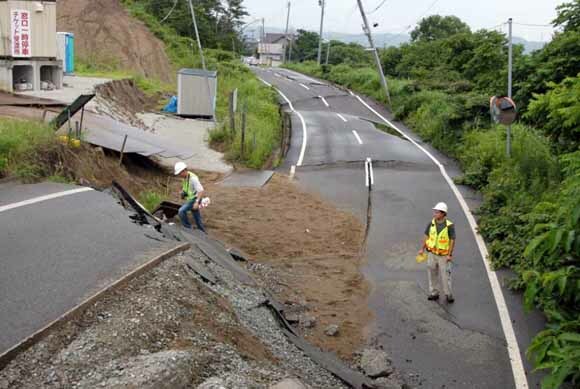 The event triggered ground failures as far as the Unouma Hills, located in central Niigata approximately 50 km from the shore and the source area of the 2004 Niigata Chuetsu earthquake. The primary event produced tsunami run-ups that reached maximum runup heights of about 20 centimeters along the shoreline of southern Niigata Prrefecture. Download this report as a 230-page PDF file (of2007-1365.pdf; 18.4 MB). For questions about this report, contact Robert Kayen.